Okay, the title needs work, but it highlights the two main releases this week on the eShop. First up we have Pushmo World, the Wii U debut of the popular Pushmo series. Push and pull blocks to climb to the top as well as create your own puzzles. If you're still not sure if you want to pick this one up, check out Matt's review of Pushmo World. Over on the Virtual Console we have Super Dodge Ball. You control a team of six players (three in-court, three out-of-court) and basically try to eliminate the other team. In single-player you control Team USA and take on teams from around the world including China and Russia, while in two-player mode each person can pick from any team in the game. Each player has their own power shots they can activate with careful timing while running or jumping. Overall it's a very fun game and one of my favorites for the NES. Toki Tori 2+ - 60% off until 9 a.m. PT on July 3rd. Classic Games Overload - $14.99 until 9 a.m. PT on July 3rd. Fractured Soul - $5.99 until 9 a.m. PT on July 3rd. Parking Star 3D - 50% off until 9 a.m. PT on July 3rd. Cypronia Games - discounts on various games until 9 a.m. on July 3rd. Shin Megami Tensei IV - $24.99 until 9 a.m. PT on July 3rd. Pushmo World ?? Pulling the puzzle world in a new direction. Pushmo World brings the ingenious game-play mechanics of the original Nintendo 3DS puzzler Pushmo to the Wii U console, and makes it easier than ever for aspiring Pushmo engineers to share their creations through the World Pushmo Fair experience. 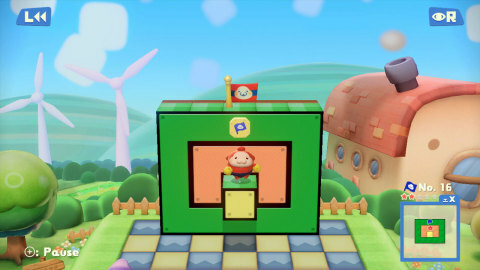 Click here to see the trailer for Pushmo World. Super Dodge Ball ?? In Super Dodge Ball, you take control of the USA Dodge Ball team and travel the world in an effort to become the best dodge ballers around. Step onto playing fields in countries all over the globe and use a combination of normal and super shots to help take down your opponents. But be careful, as some destinations have surfaces that can affect your footing. Two players can even enjoy a head-to-head game or play a spirited round of Bean Ball, a six character free-for-all. Do you have what it takes to dodge, duck, dip, dive and? ?dodge to win the world championship of dodge ball? Toki Tori 2+ ?? For a limited time, get Toki Tori 2+ at 60 percent off in the Nintendo eShop on Wii U. This offer ends at 9 a.m. PT on July 3. Classic Games Overload ?? Starting today, Classic Games Overload is only $14.99 in the Nintendo eShop on Nintendo 3DS. This offer ends at 9 a.m. PT on July 7. Fractured Soul ?? For a limited time, Fractured Soul is available at the discounted price of $5.99 in the Nintendo eShop on Nintendo 3DS. This offer ends at 9 a.m. PT on July 3. Parking Star 3D ?? Starting today until 9 a.m. PT on July 3, Parking Star 3D is 50 percent off in the Nintendo eShop on Nintendo 3DS. Cypronia Games ?? For a limited time, Cypronia is discounting select games in the Nintendo eShop on Nintendo 3DS, including Fishdom H20and Angry Bunnies. This offer ends at 9 a.m. PT on July 31. Shin Megami Tensei IV ?? For a limited time, the well-received RPG Shin Megami Tensei IV is only $24.99 in the Nintendo eShop on Nintendo 3DS. This offer ends at 9 a.m. PT on June 23. In addition to video games available at retail stores, Nintendo also offers a variety of content that people can download directly to their systems. Nintendo adds new games weekly to the Nintendo eShop on the Wii U system, as well as the Nintendo 3DS, Nintendo 2DS and Nintendo 3DS XL systems, the Nintendo DSi?? Shop for the Nintendo DSi system and the Wii?? Shop Channel for the Wii console.